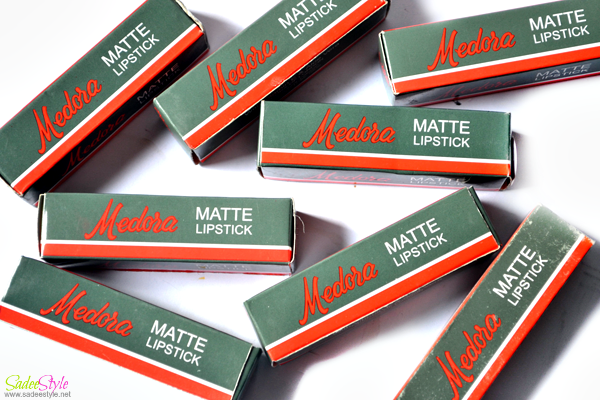 Out of so many latest or high end brand of lipsticks, Medora is still considered a Pakistan's best lipstick brand. Adorable matte range of lipsticks are available in hundred of different shades to choose from and its price make it unique among others. I own many Medora lipsticks and extremely impressed with their consistency and formula, highly recommended for extreme season. It does not melt or smudge in hot season. A formula is perfect not too sheer neither too thick, I love how it works well in every season. Medora lipsticks comes in many different shades to match all complexion, All you have to find a perfect shade according to your skin. It's thick but creamy formula stays long on lips for upto 7/8 hours without fading or smudging. I've got these amazing nine shades by my lovely friend fakhra. I adore all of them, specially pink and red shades. I own many Medora lipsticks and would like to share an individual review on all of them! so keep visiting to find out the latest Medora lipstick shades.